Unfortunately for us the Cesc Fabregas transfer saga rolls on for another day. As reported in several of the newspapers, a Barcelona delegation was supposed to be in London discussing a deal, but I doubt that's even true. We've still yet to receive a bid worthy of Ivan Gazidis talking to anyone from the Spanish champions, so what's the point in them coming to meet him personally? Are they going to inflict Chinese burns on him until he agrees to let Cesc leave for a knockdown bargain basement price? Personally I believe there has been a lot of smoke and mirrors put in place to deflect the fact that whilst Arsenal are holding firm in their belief that a world class player like Fabregas should command the fee attached to his status as Europe's best midfielder, Barcelona are still yet to make a bid in the lower echelons of what we would deem acceptable. The Independent reports what we know already, Cesc won't be on the plane to Germany. Which is hardly surprising as he's yet to take part in a training session with his team mates. 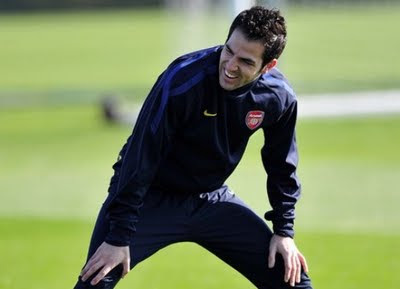 I think the most telling thing for me is whether Cesc will have any involvement in the Emirates Cup. I think the situation will become clearer by then. Plus Arsenal's deadline for Barcelona to conclude negotiations is the end of the month. Quite rightly Arsene Wenger needs time to do a deal for another player before the start of the season if Cesc were to leave. But if our captain stays, he needs to get back in the routine of training with his team mates. The Indy say Cesc is frustrated with the on going stalemate - which is quite understandable. But until Barca stump up the cash, why should Arsenal even consider selling? The Daily Mirror report Nicklas Bendtner won't be on the plane either - like that's news. If he wasn't going to Asia, why would he go to Germany? He's looking to leave the club and Arsene Wenger is taking players who will 100% be part of the team next season. Until the time when Bendtner's move away from the club doesn't happen, it's quite understandable that he's not involved. Also not heading for Germany are Abou Diaby (injured), Emmanuel Eboue (injured) and Manuel Almunia (transfer business). Arsenal target Alex Chamberlain has been fined by Southampton two weeks wages for speaking to The Sun and Daily Mirror about his ambitions to play for a top four Premier League team sooner rather than later. Saints boss Nigel Adkins meanwhile has stated his desire to keep the 17-year-old on the south coast for another season in an interview with Sky Sports News. Unsurprisingly and predictably, Southampton have gagged Chamberlain and warned him not to speak to the media again without their permission. I think Chamberlain could be an exceptional player, but I'm not sure Arsenal will spend £12m on him. That's why I think the club want to negotiate a fee with add-ons. Former captain Patrick Vieira has been speaking about Arsenal and the side's deficiencies. The Daily Mirror say Ipswich will spend £1m to take Jay Emmanuel-Thomas to tractor boy country. And finally part of a Q and A session Arsene Wenger did with 100 Asian business men during the recent trip to Asia has been reprinted by the Daily Telegraph. Which makes for an interesting read. The players will fly to Germany later. And we'll have football to talk about tomorrow. I'm really looking forward to seeing how Arsene Wenger integrates Gervinho into the side. Which position will he play and how will he adapt to Arsenal's style of play? It'll be good to have Arsenal back.